How Did Democracy Become a Good Thing? I spent yesterday afternoon at “a celebration and critical evaluation” of the work of political theorist and historian Mark Philp. My role was to talk about his involvement in a big, ongoing project being done here at Oxford—and around the world—called Re-imagining Democracy. That project has already produced one book, Re-imagining Democracy in the Age of Revolutions: America, France, Britain, Ireland 1750-1850 (OUP, 2013), with contributions on the early American republic by Seth Cotlar, Adam I. P. Smith, and Laura Edwards. It’s a book that may not yet be well known among American historians, but it should be, because the question it’s trying to answer is a very interesting and difficult one: how did “democracy” go from something feared and reviled even as late as the 1780s, to something very different by the mid-nineteenth century, and even to become the quintessential value of American politics that we know today? This recognition, I think, puts some serious pressure on the formulation, “Without political justice, no social justice.” The truth is, it could just as well have been the other way around. We know full well, in our own time, that universal adult suffrage hasn’t broken down the enormous barriers to social justice, the structural inequalities, or the twisted social relations that continue to exist, and which, of course, affect voting patterns and politics in all sorts of complex ways. How, then, did democracy come to mean “political justice” and not “social justice,” universal manhood suffrage and not collective ownership of assets or egalitarian redistribution of wealth and power? The latter had certainly been possibilities within the eighteenth-century meaning of the word, passed down from ancient Greece and Rome. The story of modern democracy is one in which democracy lost its social and economic content at the very moment it gained political ascendancy. What happened was the separation of the “economic” and the “political” into separate spheres. It was only under the conditions of this separation that a widely dispersed political power, through the universal suffrage, began to appear possible. Power relations, which had hitherto been fundamentally political issues, of lordship and so on—like who owed what to whom, and who could do what to whom, and who could make whom do what they wanted—were transformed into fundamentally economic issues, having to to do with ownership and contract. So if you want to know why democracy—defined basically as a diffusion of formal political power among the people—went from being bad to good, from being not only impossible but undesirable to not only desirable but possible, one way of answering the question is actually extremely straightforward: the real power wasn’t in politics any more; it was somewhere else, in the newly separate sphere of the economy. If we wanted to chart this transition historically, we would need to look at not only the transformation in the use of the word democracy, as Innes and Philp have done, but also at how propertied classes in the late-eighteenth and nineteenth centuries worked to put their property beyond the reach of politics, to create legal and discursive structures that insulated the real source of their power from any potential democratic threat. We’d have to look, for example, as Morton Horwitz has done in the American case, at the development of contract law and other aspects of private law which place the coercive power of the state at the disposal of private property. We’d have to look at how the U.S. Constitution neutered state governments, and how banks and corporations became private, not public institutions. In short, I don’t think we can consider the question of democracy separately from that of political economy. We can’t take for granted the idea that politics was where the power was, and that democracy really meant dispersing power to the people. The history of the United States simply won’t bear that out—and it may be worth remembering in our own time, too. Thank you for the post, Tom. This seems to me an appropriate topic for the emerging, new history of capitalism. It really got me thinking on a dreary Wednesday morning. Could you possibly expand on whether or not the primary sources support this interpretation? In other words, are there any documents that show an awareness that the power was beginning to fall into the hands of private owners and away from the political bodies? Good question, Cory. The simple answer is that there isn’t an obvious “smoking gun” piece of evidence out there–as there so rarely is in life. And of course, for this process to be happening doesn’t in any way require people to “show an awareness” of it. On the other hand, there’s a wide variety of different kinds of evidence for such a process, all of which requires interpretation. One such set of evidence is the kind of political discourse I analyse in my doctoral dissertation, which vividly demonstrates how during the 1780s people like Robert Morris, Alexander Hamilton, James Wilson, and even Thomas Paine fought to keep economic endeavours–like the Bank of North America–free from legislative interference; and they used explicitly “economic” arguments, drawn from Adam Smith and James Steuart, to do so. Another set of evidence would be, as I mentioned in the post, the subtle transformation of American legal practice–which you can see in brief notes, judicial decisions, the wording of writs and so on–away from a legal culture where the public will and public good were central, towards a fundamental commitment to private property rights. One recent scholar you might look to for this is Christine Desan. That’s only two areas, and there are no doubt many more. I’m hoping there’ll be a good fifty years left in my career to uncover everything! Tom, of course you are correct that there need not be any explicit awareness that the phenomenon was happening in order for it to be an historical phenomenon. I was merely curious if you had happened across any instances of actors reflecting on this transition as it occurred during the early nineteenth century, as these sources are always exceptionally intriguing. Thank you again for your explanation. Perhaps I’ll grab a copy of Re-imagining Democracy in the Age of Revolutions. Tom, thanks for some really thought-provoking comments. My answer – as I know we’ve discussed before – is that the American Revolution was a revolution where political control was the main goal. Even if we take the famous Becker formulation, both the questions that are central there are about political power, either in the form of Independence or in the form of pushing for greater popular sovereignty in domestic government. How would I back that up? Firstly, I’d suggest that some of the most genuinely ‘popular’ leaders in the Revolution didn’t exactly come from poor backgrounds. There are few figures I’ve encountered more popular than Gallatin in the late 1790s in Western Pennsylvania, and yet he certainly espoused different economic ideas to those current among the population he represented. Secondly, I’d look at the debates over banking in the early republic. My research suggests that really, the struggle over banks – while economically inflected – is largely caused by a feeling of a loss of control; most alternative solutions to commercial banking in Pennsylvania place the legislature as the supreme authority, and look for more ‘democratic’ controls on the operation of banks. Similar language inflects much of the debate over the First Bank of the United States. (And, I think, traceable through to Andrew Jackson and some of the state constitutional debates of the Jacksonian era, too). Both points clearly back up your statement that we need a deeper understanding of how political economy operated. But I am slightly suspicious of separating out political from social justice in the way you do in some of your comments; that seems like it might be applying 21st century terms back to the 18th century when I’m not convinced that political actors in the revolution saw the questions as all that separate. Ken, let me just make sure we’re on the same page with the question that’s being asked: what was the change in conditions that allowed “democracy” (as a word, more than anything else) to become acceptable and positive rather than a slur? I’m not sure an overtly political revolution (which I could very much agree with, by the way!) provides that change in conditions. Why didn’t the revolutionaries themselves speak of democracy in a positive way? 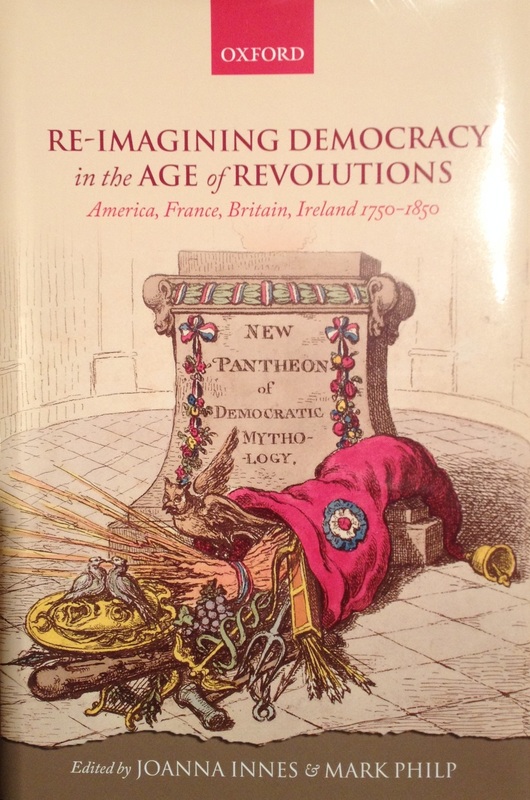 Seth Cotlar’s answer, in the Re-imagining Democracy book, is that the French Revolution made all the difference–early on, American sympathisers took up the word “democracy” from the French, and then when they parted ways with the Jacobins they gave “democracy” a new meaning through the Democratic-Republican groups. I imagine you’d be pretty on board with that view. When you talk about the struggle over the bank in Pennsylvania, we’re on exactly the same page: anti-bank legislators see the bank in *political* terms, and it *is* an issue of control. It’s the *pro-bank* party that wants to separate off the economic from the political. This is an elite project, and as I explained to Cory above, it’s one of the central or most visible ways this separation was carried out in the late-eighteenth through nineteenth centuries. So, to be clear, I’m not proposing the “separation of political and economic” as a heuristic device for historians–I’m saying it was a real process that historians need to investigate. It’s not a process that was completed in the nineteenth century (and it hasn’t been completed yet, despite the neoliberal project!). Indeed, there can never be a *complete* separation, for some fairly obvious reasons. But that doesn’t mean a crucial change didn’t happen somewhere around the first half of the nineteenth century. Political actors in the revolution were at the very beginning of this process–or before it even started. That’s precisely one reason why, for them, democracy could not be “a good thing”. This is a provocative piece, lots of new information and interpretations for me, thanks, Tom. I’m very concerned that, in any discussion of democracy and democratic political theory, we seem to lose sight of the devastating fact that (as far as I know) at no time in our history have we had sustained, full participation in voting by everyone eligible to vote at the time. The modern, abysmally low turnout is frightening. I think we have never had a functioning democracy in the sense of the electorate fully, knowledgeably and conscientiously participating in the political process. Richard, thanks for your comment. I think there’s an obvious connection between the lack of real power in the vote–power over the socio-economic conditions of our lives–and lack of turnout. Who cares about a political act that legitimizes the system without actually changing it?